Home Why Did the Pedestrian Cross the Street? Many may think that the answer should have been “to get to the other side”. In truth, the more commonly known answer, “to get to the other side” falls a bit short. That answer assumes that we build our cities for function only, when there are many more reasons, to create excellent places for people. These are places that function well and also contribute to making a pleasant and comfortable environment for pedestrians. Crosswalks and intersections are a critical piece of a walkable city or town, and require appropriate design consideration for their overall success. 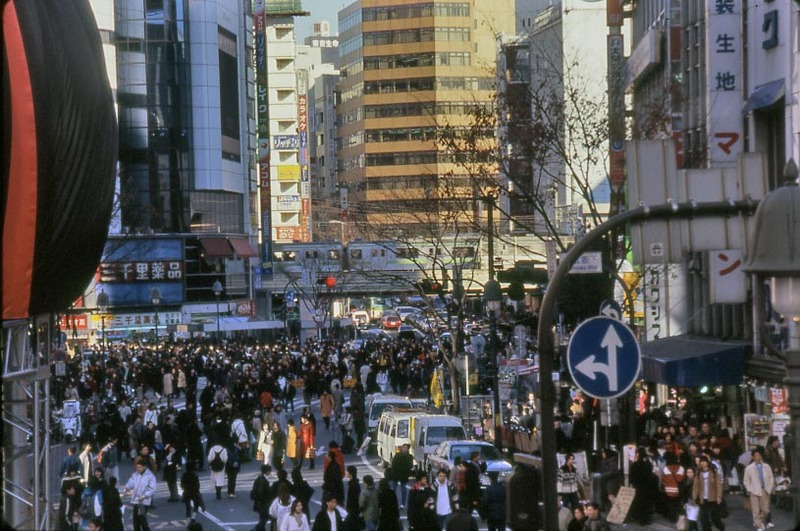 Pedestrian activity in urban districts need to be carefully considered when planning. Intersection design can enhance safety and create Place. Pedestrian conditions vary from place to place – Intersection design should be context sensitive and solutions need to adhere to the unique environments that they serve. 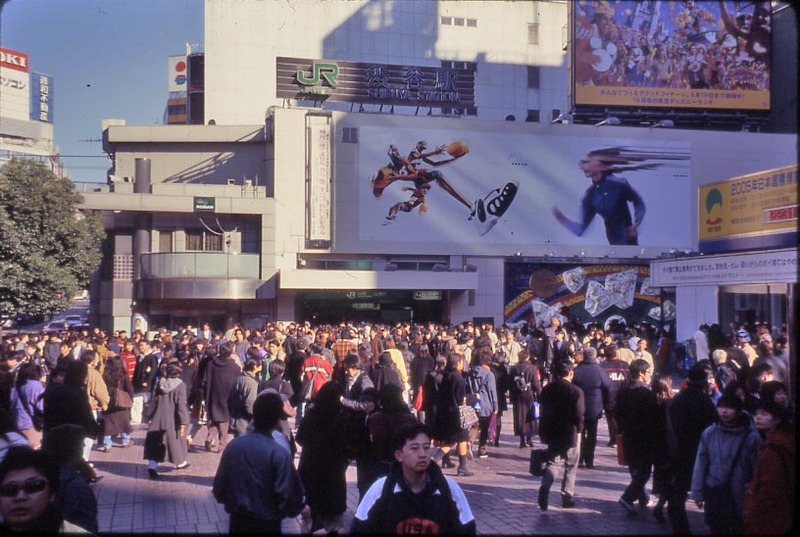 Pedestrianizing an intersection isn’t only about the addition of a crosswalk. To create a pedestrian street crossing in the most effective manner actually involves a series of moves that collectively work to strengthen the physical condition for all users including people, bikers and vehicles. The reality is, that the actual crosswalk itself is one of the least important elements by comparison. The contribution of curb bump-outs, the narrowing of the street, full lane striping and added vegetation help to make a higher quality pedestrian environment for a street intersection. Intersection design should create a safe and comfortable condition for pedestrians, bicycles and automobiles. 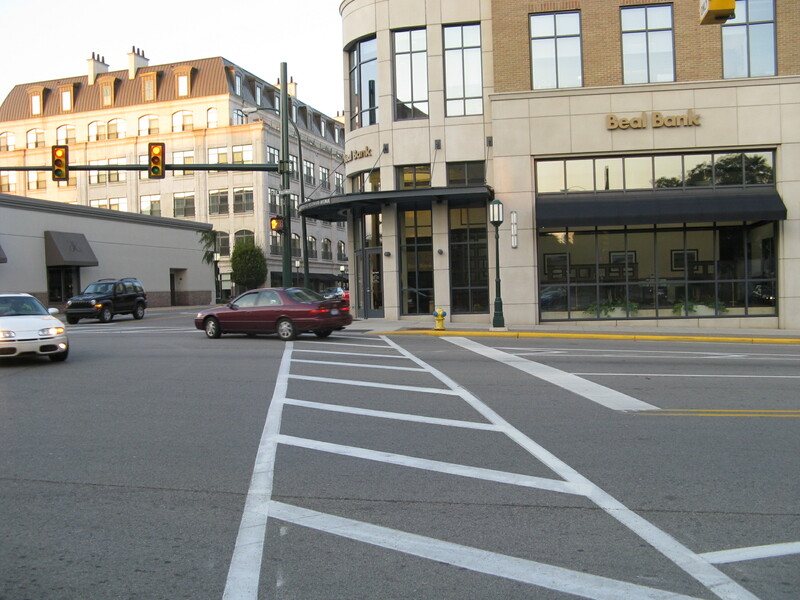 Crosswalks: Clearly define the striping of the designated crosswalk. The “Continental” pattern, with its wide parallel stripes is easiest to see, especially on black asphalt paving. Also, vinyl striping is more affective than white paint, since it is opaque, doesn’t fade, isn’t as diminished by dirt and does not wear off in a few months, needing to be repainted at least two to three times per year. Also, the vinyl material has a reflective surface, which is activated in the dark with automobile headlights, making it more visible than paint. 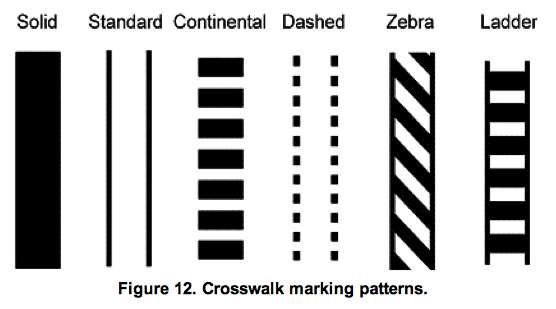 Standard Crosswalk Patterns – The Continental pattern is one of the most effective. 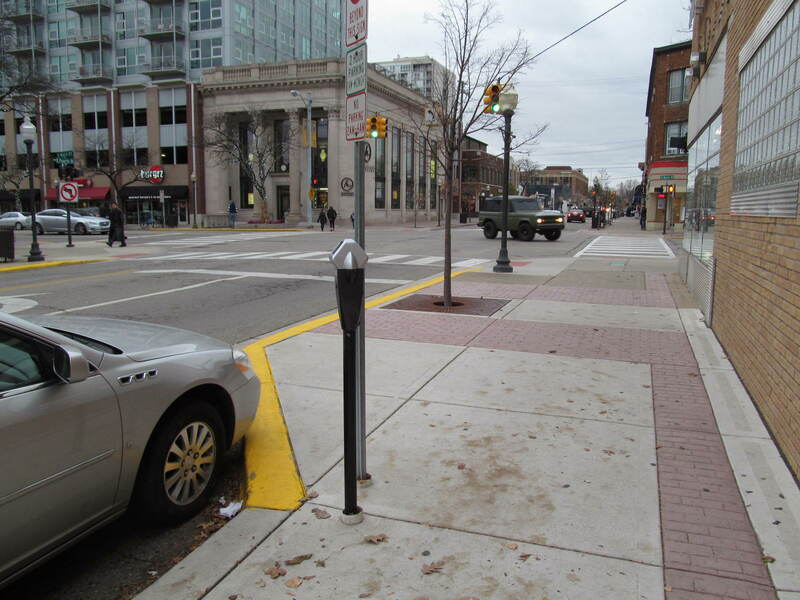 Additionally, in a pedestrian-oriented area, like a downtown district, all corners should have a designated crosswalk. Since adding a crosswalk requires initial costs and maintenance and may potentially take a parking space or two away from the street, some municipalities only install crosswalks on one side of the street and not at all corners. Initially, this may be a logical approach, however, the reality is that pedestrians are naturally going to cross the street from the location of where they are and will not cross two streets when they can cross only one – it is the path of least resistance. In planning for the accommodation of pedestrians, it is most appropriate to establish a safe and natural path of travel than to assume the pedestrian will overlook the easiest (closer and quickest) path for the safest but farther and more time consuming one. Infrastructure planning requires thinking ahead and determining what will likely occur and then design for the safest and most effective way to achieve it, if at all possible. This intersection has three pedestrian crossing conditions and has only two crosswalks. 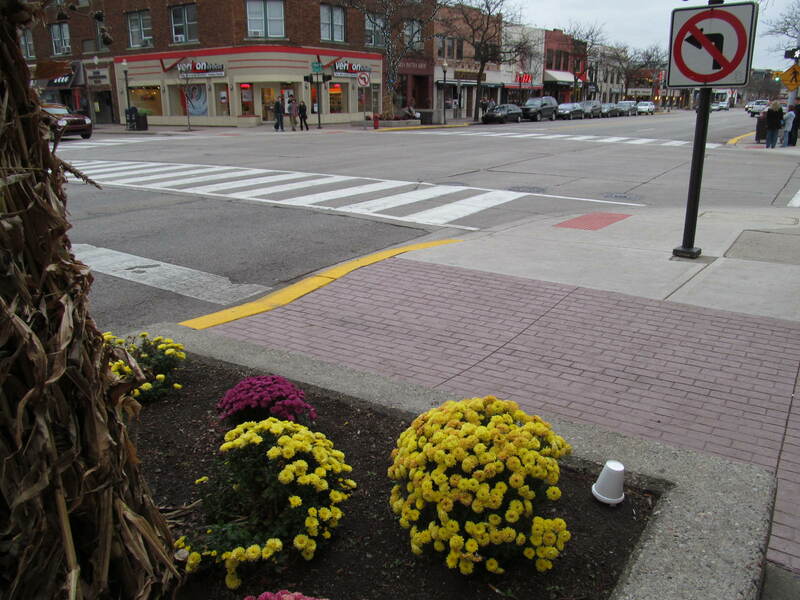 An additional striped crosswalk should be added to the upper curb, where pedestrians often cross regardless, to enhance their safety and comfort. 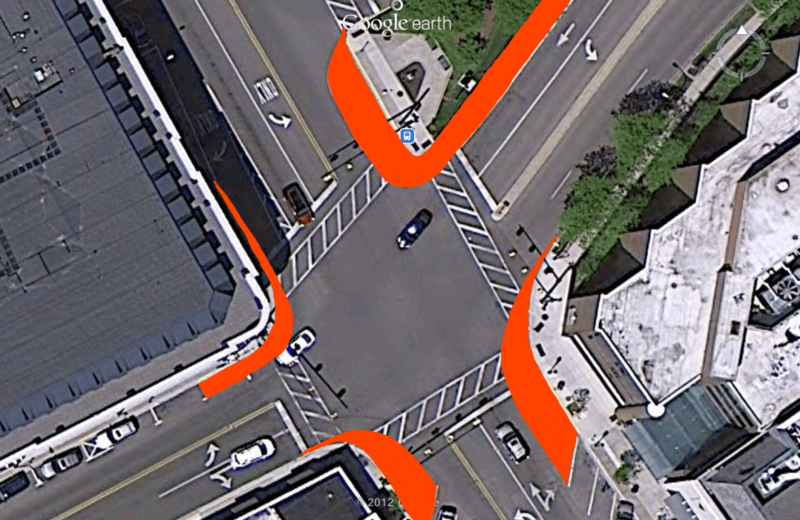 Bump-outs: Wherever possible, extended curbs, or bump-outs should be created at pedestrian-oriented intersections. These extra pedestrian zones at corners provide an extra amount of sidewalk for the walkers but also minimize the distance form curb to curb. This decreases the distance and time that a pedestrian is in the street, and minimizes the potential unsafe interaction of an auto-pedestrian conflict. This bump out includes a widening of the sidewalk, the addition of trees and a narrowing of the street crossing distance for the pedestrian. 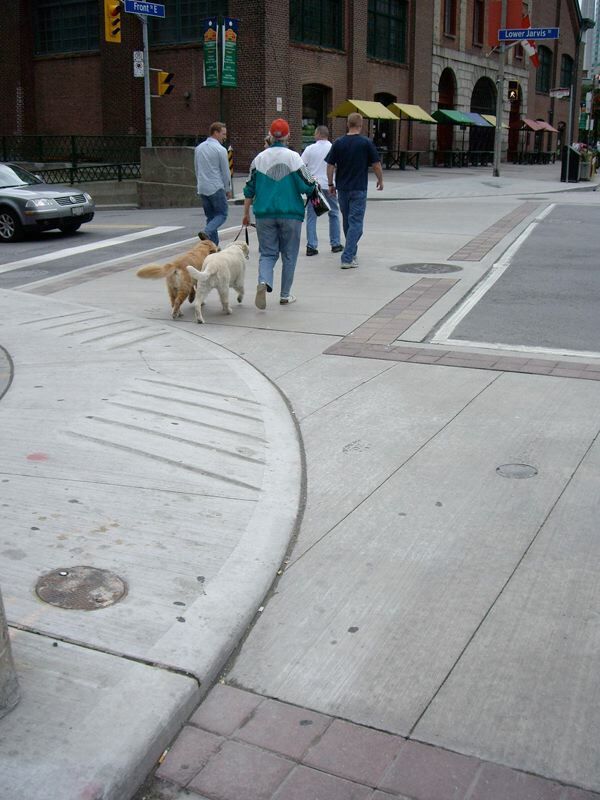 Bumped out corners narrow the distance for pedestrian to walk from curb to curb increasing safety and comfort. This intersection illustrates the need for added pedestrian enhancements to narrow the distance for crossing. This intersection needs added pedestrian enhancements to narrow the distance for crossing. 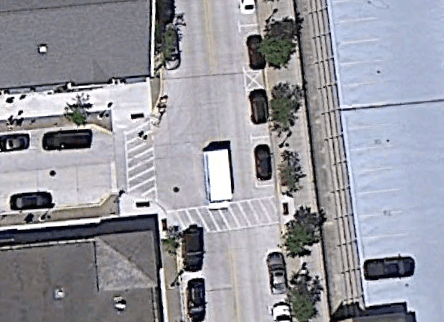 Note the distance from curb to curb and the striped areas that do not allow for vehicular use. The red areas indicate where bump outs and extended curb conditions could be constructed to add safety, vegetation and to slow traffic speeds. 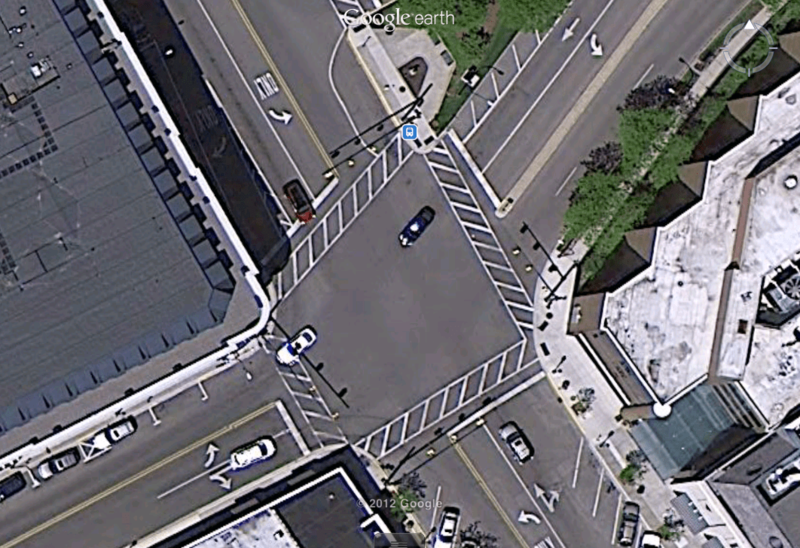 In the example shown, the increased sidewalk condition decreases the crossing distance by about thirty feet without changing the traffic lanes. Vehicular Lane Width: Minimize lane width to diminish the crossing distance for the pedestrian and to slow traffic. The Institute of Traffic Engineers (ITE) recommends 10-11 foot wide lanes in pedestrian oriented environments. 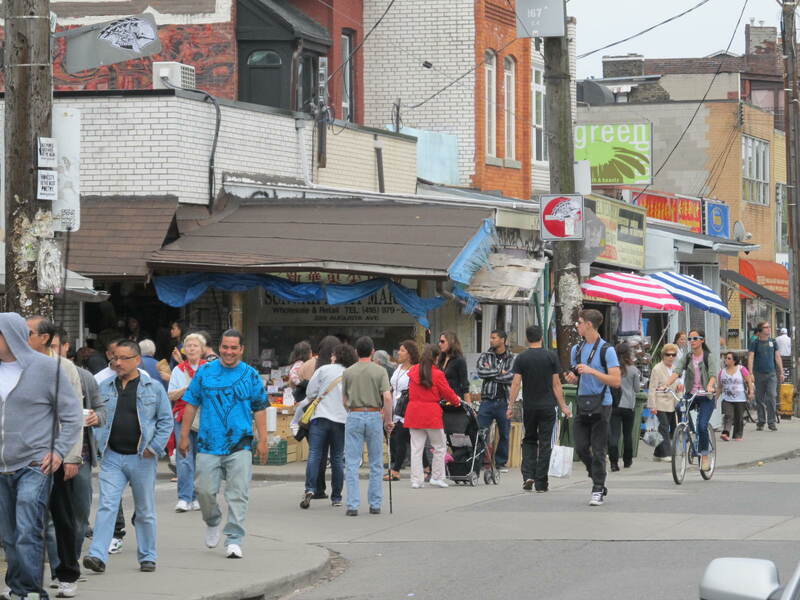 The narrower lane width will equate to a safer and more comfortable pedestrian environment. The Institute of Transportation Engineers recommends 10 to 11 foot wide travel lanes minimizing pedestrian crossing distances and slowing traffic speeds. 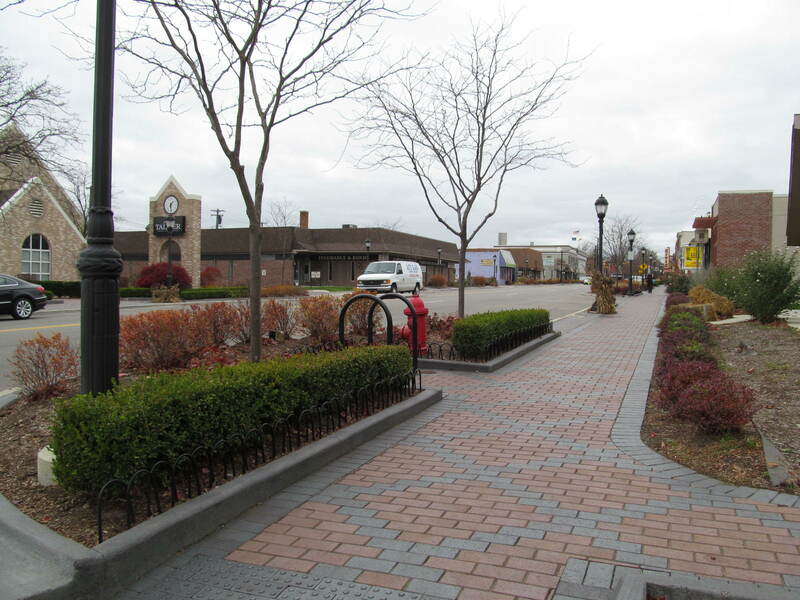 Vegetation: Adding grass, plantings and trees to the overall intersection will minimize hardscape and soften the affect of the quantity of required paving for sidewalks and streets. Trees along a street, increases the density and narrows the perception of the overall street width, which in turn results in slowing down automobile driving speeds. This corner condition illustrates how wider sidewalks and bump outs allow for increased vegetation and trees. 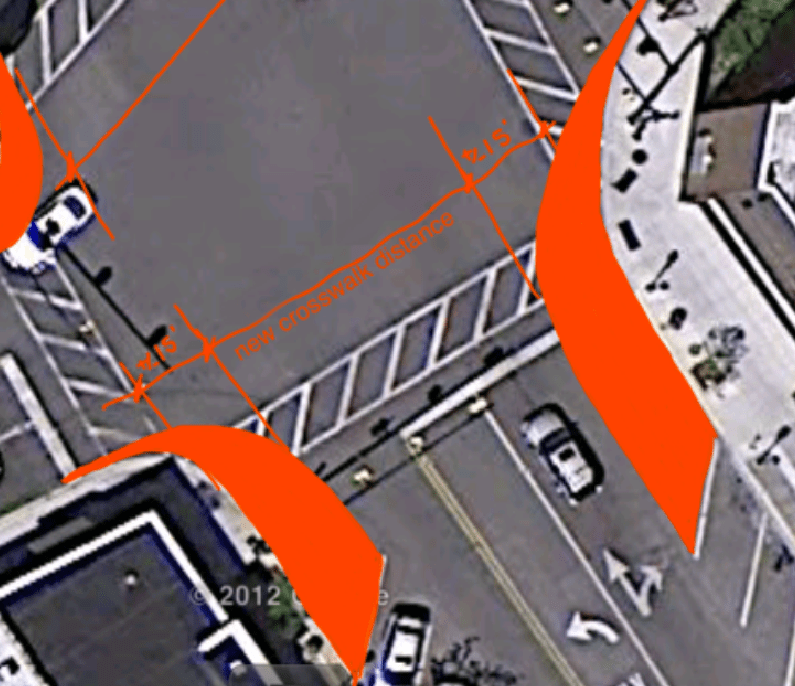 This corner condition illustrates enhanced crossing and sidewalk conditions with additional vegetation. Intersection design is consistently changing and there are new advancements being considered in cities all around the world. These ideas and technological elements, that may provide a more successful people and vehicular intersection condition, are being integrated into our built environment every year. New elements include, signs, crossing and timing countdown signals and all-way intersections that stop traffic and allow pedestrians to cross diagonally. Some cities of the world already have these and other advancements and many more will be considering them in the coming years. Yonge and Dundas Streets intersection, Dundas Square, Toronto. This intersection has heavy pedestrian activity and recently changed to an all-way crossing condition. The signals vary and for a short time allow for pedestrian crossing in any direction while automobile traffic in stopped. Shibuya District, Tokyo. 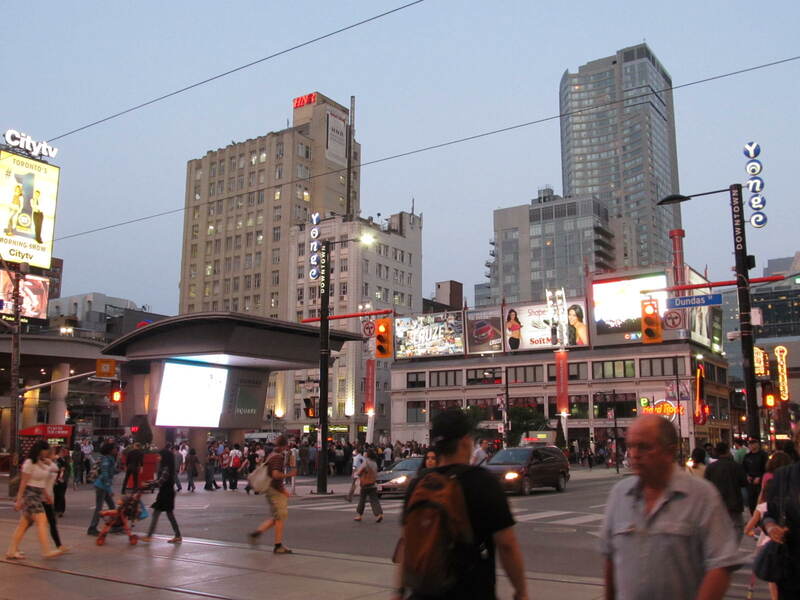 This intersection, adjacent to a transit stop, accommodates millions of pedestrian every day. The physical design, signally and crosswalks have been designed to address the needs on this specific context. 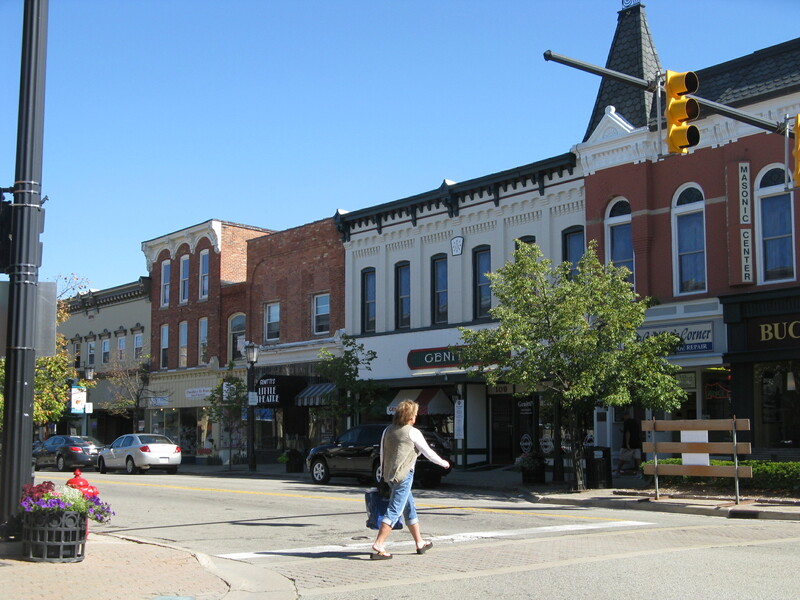 Building streets and sidewalks in a city, rebuilding and maintaining them are an important part of what a municipality is required to do in achieving a safe and properly functioning environment for its users. The design and planning of those important infrastructural advancements can be done in numerous ways. For little or no difference in cost, the incorporation of good planning and design ideas can bring a significant enhancement in the public infrastructure, while creating a dramatic built environment for the people who live, work and recreate there. The overall goal is to create the best environment for the pedestrian, safe and comfortable, while still accommodating the needs of the automobile.